View More In Tree Skirts - Page 10. Diameter - 35.4" (90cm), perfect for any size tree from small to very large trees. Pure Christmas Tree Skirts - Luxury faux fur Christmas tree skirt, full size tree skirt in snow white. 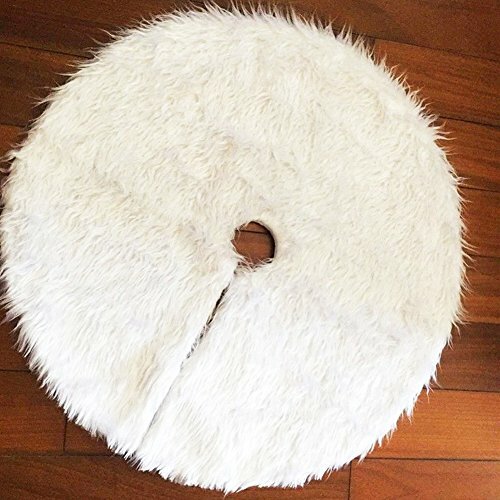 Material - This adorable tree skirt is made from pure white Plush. High quality plush fabric material with soft and comfortable texture and impeccable crafts. Thick and soft, well made and will last for years to dress your tree, reusable for years and years. Perfect for Christmas tree decoration, creating an enchanting Christmas holiday wonderland and party joyous atmosphere and beautiful holiday memories. Makes the perfect Gift for family and friends! If you have any questions about this product by CHICHIC, contact us by completing and submitting the form below. If you are looking for a specif part number, please include it with your message. SORRENTO Deluxe Embroidered Pine Branches Cherry with Pintuck Border,Extra Large ,Christmas Tree Skirt-50"